Heavy duty A4 sheet protectors made from durable polypropylene. Pockets will not react with photographs, photocopies or documents. Reinforced binder edge. Resists tearing and cracking. Fits all 2, 3 and 4 ring binders and files. A4 size - Heavy Duty - 70 Microns. Box of 100 transparent sheet protectors. Standard document sleeves for archiving and storing documents. Made from acid free, non-stick Polypropylene material, durable for long life. A4 size - Light Weight - 35 Microns. Box of 100 clear sheet protectors. Marbig Light Weight Sheet Protectors are affordable choice for single use filing applications. Pockets will not react with documents and lift print or cause smudging. Reinforced binding edge. Resists tearing or cracking. Low glare finish for easier viewing. 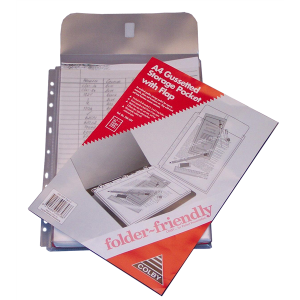 Fits all 2, 3 and 4 ring binders - no need to punch holes. 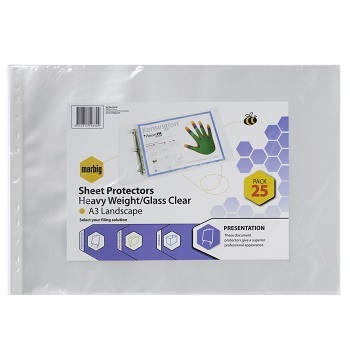 Box of 300 clear sheet protectors. Ultra-clear, high gloss finish perfect for showcasing documents. A4 size - Heavy Weight - 70 Microns. Box of 100 ultra clear sheet protectors. A4 size - Light Weight - 40 Microns. Silver strip pockets have a metallic binding edge that adds a professional finish that makes them perfect for presentations. Box of 100 glass clear sheet protectors. A5 size - Light Weight - 35 Microns. Crystal clear, highest quality A3 size Sheet Protectors for a superior, professional appearance. Ultra clear, gloss finish perfect for showcasing documents. A3 size - Heavy Weight - 80 Microns. Pack of 25 Portrait format sheet protectors. Bulk box of 100 Portrait format sheet protectors. Bulk box of 100 Landscape format sheet protectors. Extra heavy-duty glass clear PVC pocket with 25 mm capacity for heavy duty use. Australian made. Fits all 2, 3 and 4 ring binders. A4 size - Extra Heavy Duty - 200 Microns. Pack of 10 sheet protectors. This version has the addition of a flap, which is secured by Velcro. Pack of 10 sheet protectors with flap. Heavy-duty glass clear PVC pocket with 25 mm capacity for heavy duty use. Australian made. Fits most 2, 3 and 4 ring binders. A3 size - Heavy Duty - 175 Microns.